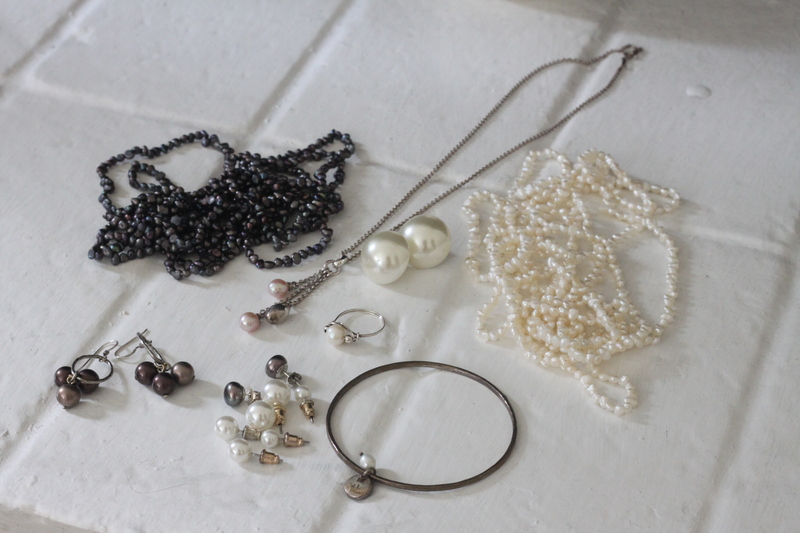 Slight might be an understatement in this instance… For some reason I seem to keep acquiring bits and pieces of pearl jewellery, and they tend to be amongst the most frequently worn items I have. Not sure why, I just love the effect and I think pearl earrings are really flattering. Plus you can wear pearls to all occasions, and they don’t have to look like they ought to be worn with a natty little twinset. I took this pic of my current collection (pretty sure I have more in the UK! ), these are the pieces I have in San Francisco with me. Clockwise from top left: String of grey pearls, 21st birthday present. Silver necklace with pearl drops, another birthday present. Big fake pearl earrings, bought from Dorothy Perkins in the UK ages ago. That these have survived multiple nights out without me losing them is a small miracle. String of cream pearls, another 21st present, from the same place as the grey ones. 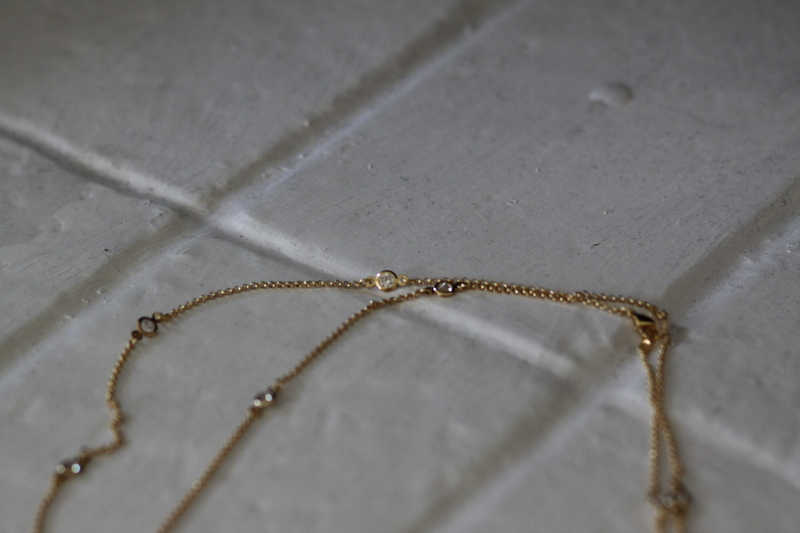 I wear them separately or sometimes together, and I like them as I can loop them twice and tie a knot in them to make a lariat-type-thing, or loop them four times for a layered look. Silver bangle with a pearl on it (in desperate need of some polishing!). This was a 21st present from my best friend, the disc has 21 written on it and we got similar but not matching ones from a cute boutique in Edinburgh, where we were both students at the time. Pile of pearl studs – the white ones are from Forever 21, from this haul. The grey ones were yet another 21st present (do we detect a theme that year?!) from a guy friend, under the guidance of the bestie. A friend of mine used to have family living in China so used to buy me multiple pairs of cheap pearl earrings (as invariably some get lost from time to time) but this year I lost my last of those! Thank heavens for my F21 replacements. Dangly grey pearl earrings, gift from my mum. She found these somewhere in Wales I think and they’re fab for dressing up jeans and a plain top when I can’t be bothered doing anything more creative! Ring in the middle, bought at the Charleston City Market years ago. I found some cute pearl bits of jewellery over at Bauble Bar too…. Yesterday I skipped town for the sunny climes of the East Bay – I had an interview in Walnut Creek. Left SF in thick fog and enjoyed an afternoon pottering around in the sunshine after my interview. 🙂 I found a cute consignment shop and tried on some bargainous items – sadly none of which were quite right. I tried on a loose Elizabeth & James blouse that was only $43 but wasn’t quite sure. A photo text to my bestie in the UK confirmed that it wasn’t for me – how I love technology (and my bestie!). For anyone that wants to message people internationally, I use What’s App, a cheap app that iPhones and Blackberries (and I assume Android too but I don’t know for sure) can send messages to one another using the 3G instead of the phone network. Score. Then in the evening I trained with my netball team for two hours and received a very exciting gift from a friend! She got me this lovely necklace from the Bauble Bar, a cute new site that has lots of lovely jewellery. I’d been scoping it out for earrings to go with my grad party outfit but hadn’t ordered any in time, but they have so many beautiful pairs to choose from! This is the necklace she bought me which I LOVE. You can wear it looped twice and the little crystals look so pretty! So pretty. 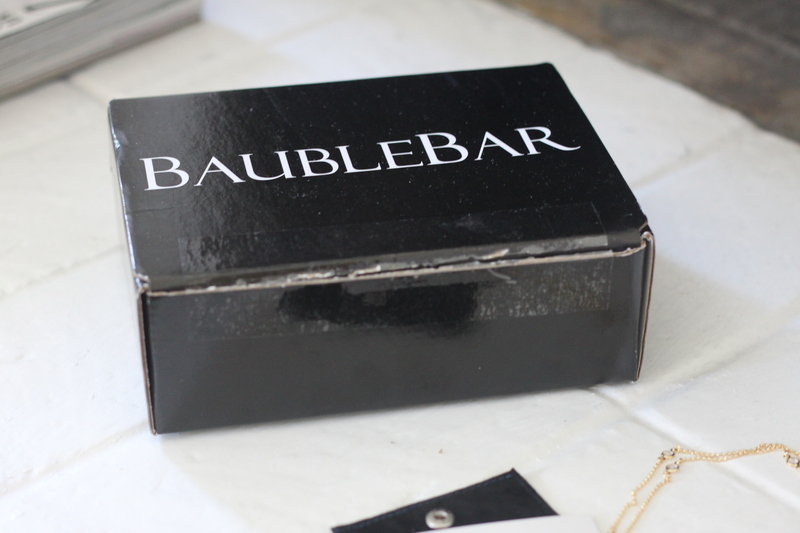 It also came in this little box with a handwritten note in it, isn’t that a cute touch? There’s a blog too which is also worth checking out. Full marks Bauble Bar!